"A great appetizer that is loved by all, especially men. Serve these meaty, cheesy delights on game day! For later use, place the topped bread on a cookie sheet in the freezer for 1 hour. Once frozen, the slices may be stored in freezer bags." Place ground beef, sausage and onion in a large, deep skillet. Cook over medium high heat until meat is evenly brown and onions are soft. Drain liquid. Mix in the processed cheese food, oregano and Worcestershire sauce. Stir continuously until the cheese is melted. If the bread is not sliced, cut it into thin slices. Spoon approximately 1 tablespoon of the mixture onto each slice. Place the slices in a single layer on a baking pan. Broil the slices 10 minutes, or until the cheese is slightly browned and the bread is toasted. See how to make Chef John's super-meaty Bigos, or Polish Hunter's Stew. 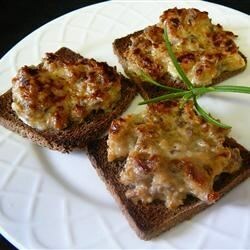 Try making them with a spoonful of garlic mashed potatoes on the rye,then add the meat mixture. When cooled somewhat top with a slice of cucumber or grape tomato ~Delicious appetizer. These were fantastic. Just like my grandma used to make! I also tried the previous crock pot idea for a carry-in. It worked well, but if I had to choose, into the oven they would go. We call this Hanky Panky and sometimes serve in a crock pot with either party rye or our favorite Tostitos scoops.